I’ve created this fabulous video to show you the aftercare steps I take before bed to make my vintage curls last as long as possible. I’ve experimented with a few ways you can re-pin your hair before bed but this is the method I’ve found most successful and comfortable for sleeping. You’ll just need a hair brush, hair sponge/hair rat, bobby pins and hair scarf.In this tutorial the hair sponge/hair rat I’m using is 4 inches long, and the chiffon headscarf is 26 inches by 26 inches. I’m so very excited to finally have upgraded my camera, for far too long I’ve just been using my webcam to create videos. I have so many exciting new videos planned as well as re-filming some of the videos I’ve made in the past. 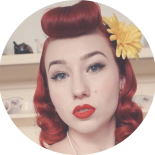 This entry was posted on March 9, 2017 by Miss Lady Lace in Pinup, Uncategorized, YouTube and tagged 1940's, 1950's, blogger, glamour, miss lady lace, miss lady laces pinup blog, perth burlesque, perth pinup, perth pinup blog, perth pinup community, pin up, pinup, pinup blog, pinup blogger, pinup fashion, pinup girl, pinup life, pinup lifestyle, pinup perth, red lips, retro blog, retro girl, retro glamour, the perth pinup community, victory rolls, vintage, vintage blog, vintage blogger, vintage fashion, vintage girl, vintage glamour, vintage perth, vintage pinup blog.